Depending on the application and the types of flames most likely to be encountered in a facility, personnel can choose from a wide range of detector offerings to meet the facility's detection needs. Detectors include Single IR, Triple IR (IR3), Multi IR, UV, UV/IR2.5µm, UV/IR4.5µm and Ultra-Fast UV/IR detectors. As an additional option, detectors can be ordered with or without built-in test (BIT) capability. The FV-40 Series includes the latest technology for the best detection and resistance to false alarms, while keeping budgets in mind. All units feature heated sensor windows to eliminate condensation and icing, sensitivity selection, multiple regulatory approvals and flexible communication options, including 3-color LED, 0-20mA, HART® Protocols, RS-485 and MODBUS®. Three built-in relays also provide triggering of external systems. Robustly designed to handle tough work environments, FV-40 Flame Detectors showcase long-life and high-reliability features. An FV-40 can be ordered with aluminum or 316L stainless steel casings/mounts and all circuit boards are epoxy-coated for protection. All units meet MIL-C-810C standards for humidity, salt, fog, vibration, mechanical shock and temperature extremes, while the housings meet IP66, IP67 and NEMA 250 6P water and dust egress standards. The SIL-2 approval per IEC61508 is a final statement in reliability. For over 80 years, 3M has built a strong reputation for innovation and high reliability. 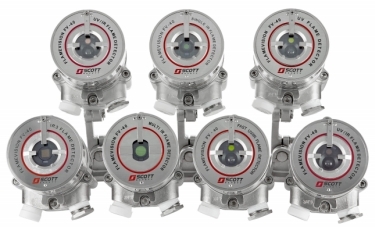 These same qualities are evident in the development and success of the 3M line of gas and flame detection.